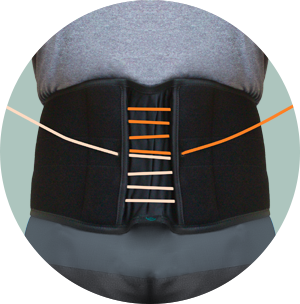 The Aspen Lumbar™ Support features a simple, elegant design with the essential elements required in a spinal brace to help support fatigued muscles that spasm and cause pain. Utilizing Aspen’s foundational inelastic design, elastic qualities have been incorporated for a tailored and comfortable fit. This innovative combination, coupled with Aspen’s patented compression system, provides a non-invasive, drug-free treatment option for the active patient. Featuring a low profile design, the Aspen Lumbar is comfortable for extended wear and can easily be worn under clothing. 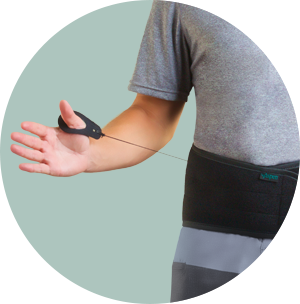 Aspen’s patented 4:1 tightening mechanism allows the patient to independently adjust the top and bottom of the brace to provide localized compression where it is needed to support fatigued muscles that spasm. When first applied, the brace performs like an elastic brace. Extending the pull tabs activates Aspen’s patented compression system for a second stage of therapeutic support.